A Turkish judge has ordered an “expert investigation” into the Lord of the Rings character Gollum to determine whether comparing President Erdogan to the ring-fancier is an insult. The judge made the request in a case against Bilgin Ciftci, a physician, who faces two years prison for comparing the two. 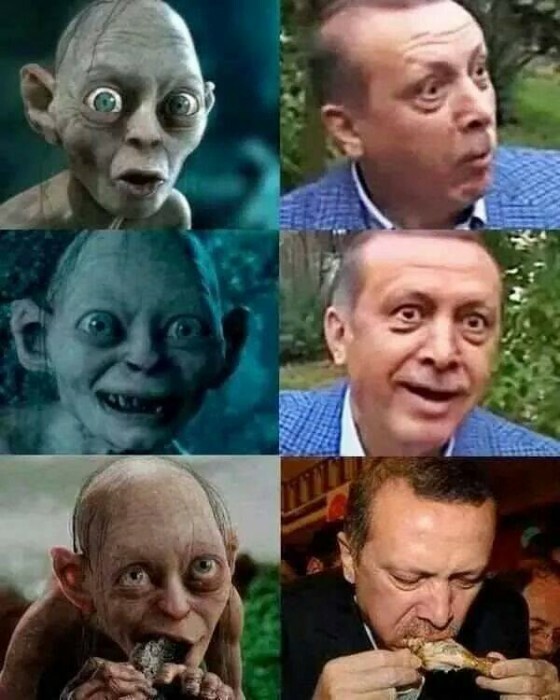 The case centres on a picture posted in October by Ciftci which compared Erdogan to Gollum in a series of poses. Following this, he lost his job and now (according to Time) faces up to two jears in jail for insulting the president. Neither the prosecutor nor the judge presiding over the case has seen The Lord of the Rings film adaption series in its entirety, so the court has brought in two academics, two behavioral scientists and a media expert to determine if Cifti did indeed seek to insult the President. The crucial point here, though, is that insulting a president — or any other politician — should not be a crime in the first place. Erdogan may well find the picture offensive but a country that aspires to join the EU needs to become a little less thin-skinned about their institutions and recognise that criticism — however it is expressed — should not be a crime. And here’s the picture that caused all the trouble.